Our extensive range of handles and knobs are available in one or more (depending on the product) of the Handle Surface Finish options shown. Please view the listing of your preferred product to see the finishes available and remember when placing your order to let us know your chosen finish. Whilst every care has been taken to ensure that the colours and finishes featured in our Shop pages are accurate, due to the processes involved in the production of the Shop pages, the reproduction of colours and finishes cannot be guaranteed as a true likeness. They should therefore only be used as a guide. 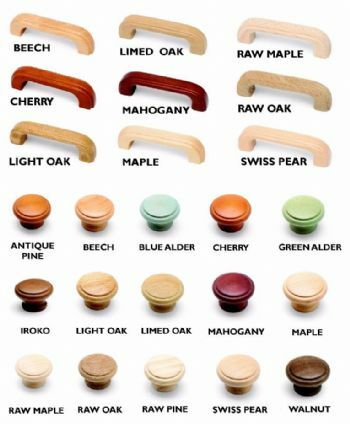 Wooden knobs and handles are made from a natural product and therefore are subject to colour and wood-grain variances. We are therefore unable to guarantee that all items within an order will be an exact match.